In one of my previous/favorite devotions titled “A Conforming Light,” I was inspired by the Fastnet Rock Lighthouse to reiterate what the Apostle Paul taught the believers in Rome, Corinth, and Ephesus; He reminded them, and us, that the church is called to conform to the person/character of our Savior, Jesus Christ. In this devotion, it was the Sullivan Island Lighthouse a.k.a. the Charleston Light (pictured above) that inspired me to remind us that we are NOT to conform to the ways of this world. The Charleston Light was built in 1960 on Sullivan’s Island, South Carolina. It measures 140 feet tall and is constructed of steel with an aluminum alloy skin. Besides being the last major lighthouse built in the United States, it is also the only lighthouse shaped like a triangle (best to withstand hurricane force winds). Although these two facts alone are enough to write a devotion, that is not what initially caught my attention. What inspired me to write this post were three other facts. The tower was originally equipped with an amazing twenty-eight million candlepower light, produced by carbon arc lamps costing $900 a piece. That made it the second brightest lighthouse in the western hemisphere! But that much power proved to be too bright for the locals. So, at their request, the Coast Guard reduced the light to 1.5 million candlepower. As lighthouse for God, we have been entrusted with the light of His word, the light that drives away sin, exposes the evil deeds of Satan and illuminates the path to eternal life. Said light has proven to be much too bright for many who are still in spiritual darkness. Those who are living in sin and are used to the dimmer lights of secularism will always complain about the light of righteousness. Nevertheless, we cannot afford to reduce our spiritual radiance simply because of those who oppose the message of the Gospel for it is the only light that has the power to change lives and grant salvation. Plus, dimming our light in order to please the world would suggest that we are ashamed of the Gospel and that we care more about their opinion than that of God’s. Such an attitude would require that we truly question the genuineness of the faith we proclaim. Originally, the tower was painted white and red-orange. This too proved to be unpopular with and bothersome to the residents who complained about the distracting glaring orange hue. So, soon after, the tower was repainted to a more discreet white and black. God has gifted/equipped each of His children with unique abilities to shine wherever they are. We shine not only by sharing the Good News of Jesus but by living an uninhibited godly and biblically obedient life unto our heavenly Father. Because of this, we will inevitably provoke some people to anger and to retaliate, especially when what we believe and do is contrary to the liberal worldview. But no matter the challenges we may face, we must continue to live according to God’s standards and not the world’s. We cannot and should not tone down, camouflage, or politically adjust the way we live simply because it “bothers” other people. Remember, our righteous living is to honor, please, and thank God, not man. Unlike historic lighthouses which feature spiral stairs for people to climb to the top, the Sullivan Island Lighthouse boasts an elevator as well as an air conditioning system. However, in spite of all the public appeasing changes and structural modernizations, this beacon is still not accessible to the public. It has many problems associated with its structure, including flaking lead paint which can get into the air when/if stepped on. For this and other reasons, it can only be admired from behind a perimeter fence. When/If we change and conform to the opinions and agendas of the world we can become like the Charleston Light. We would still be able to (dimly) shine but because we chose to be politically correct, we wouldn’t be able to offer any real reason for people to intentionally and sincerely engage us and be interested in the life-changing power of the Gospel. Plus, like the lead paint on this lighthouse, our piousness would simply be a religious coat that will eventually peel off and hinder people from coming to the saving knowledge of Christ. So, for their sake and ours, let us remain a light that conforms only to Jesus. As children of light, we do not belong to this (moral/physical) world. Therefore, it shouldn’t surprise us when, just like in the early days of the Charleston Light, we encounter people who feel threatened and uncomfortable with our way of life. If you or someone you know was once a citizen of this fallen world and have now transferred citizenship to God’s kingdom, then you should be able to understand and relate to their fear. As a result, you should be more eager to live a life that proclaims the redeeming power of Christ and earnestly pray for their salvation. You should also be willing to love them and to bless them whenever you have the opportunity. Remember, it is perfect love that drives away fear (and sin). Prayer: Father of Light, remind me that it is your light that shines through me. Let it not grow dim as a result of me conforming to this world but rather, let it shine brighter each day as your word conforms me more and more to the image of your Son. In Jesus’ name, I pray, Amen. And thank you, brother. 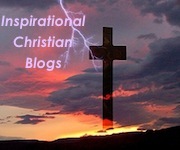 May you continue to brightly shine HIs light through your inspiring blog and in everything you do! Always connecting and focusing the LIGHT on our Christian movements and directing us from the hazards that are often hidden in the dark oceans surrounding us. I LOVE IT!!! And as an added note to Romans 12:2 and conformity: the word “transformed” in the Greek is metamorphoo, where we get the English word “metamorphosis” – caterpillar to a butterfly in different stages. Thank you, brother, for your unfailing encouragement. I give all glory and honor to the One whose light guides me and inspires me. May that same light continue to shine in and through you so that we may gain a clearer and therefore deeper revelation of His precious word. Yes, Indeed we are the light of this world. And we should let it shine!!. Awesome! I liked this post for everything in it! 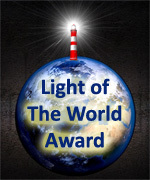 Joe, the creator of The Light Of The World Award, speaks very loudly in this devotional. The history behind this lighthouse is cool but his points on how it relates to our walk with God are spot on! Thank you, Stuart! Blessings, brother.